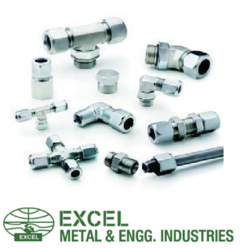 Our client can avail high quality range of Flareless Bite Fitting. This comes with latest design progressive ferrule for total leak proof performance. Our range is made from high quality raw material and is offered at market leading prices. - Material : Steel IS 226 Phosphate, Brass, SS304, 316. Backed ourselves with sound facilities and talented workers, we have emerged as the foremost firms of best quality Hydraulic Flareless Connector. 1) Designed as per DIN 2353/ ISO 8434-1. - Offered in a variety of materials such asSS316/L, SS304/L, CS, Monel, Brass. Pressures : Up to 10000 PSI. We are manufacturer and supplier of Flareless Fittings. - Variety of styles , shapes and sizes. Engaged in manufacturing of flareless fittings. sizes : in mm upto 44mm od , in inches upto2" od and 2" nb size. pressure : upto 640 bars (10000 psi ) depending upon the type and size. 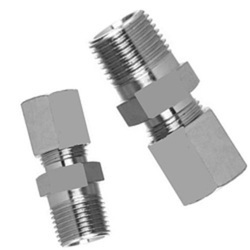 Machine Tools Syndicate Flareless bite type fittings has a unique three-piece design having a body, a special case hardened ferrule and a nut. Unlike ordinary compression joints, when the nut is screwed on to the body, the ferrule grips the pipe in position and perceptibly bites in the pipe surface to provide a positive seal.